Posted April 30th, 2013 by alexa & filed under Families. From film to digital in two years! When I started on my photography journey I wasn’t quite sure of the direction I wanted to go in. I just knew that I wanted to turn my hobby of taking photographs into my profession. So I enrolled on a two year course at the City of Westminster College. It was a time of vast change in the photography world. The course started using film in the dark room and by the time I graduated I was totally digital! The course was fantastic and by the time I finished I knew I wanted to spend my time photographing people. I feel lucky enough to have done that ever since then. I photograph weddings, engagements, families, musicians, headshots, schools, nurseries. So many different areas of work, but all with one thing in common – people! And the more photo sessions I did the more I liked the really natural, documentary style. So I now try, as much as possible, to photograph life as it happens, without too much intervention from me. Sometimes a helping hand is needed though and when these five lovely children posed on the sofa with their grandma I knew it was going to make a lovely family portrait, which it did, but I wanted more. So I asked the children if they wanted to test out who was the most ticklish amongst them. That was it – the laughter began, I clicked away and that was how this image was made. 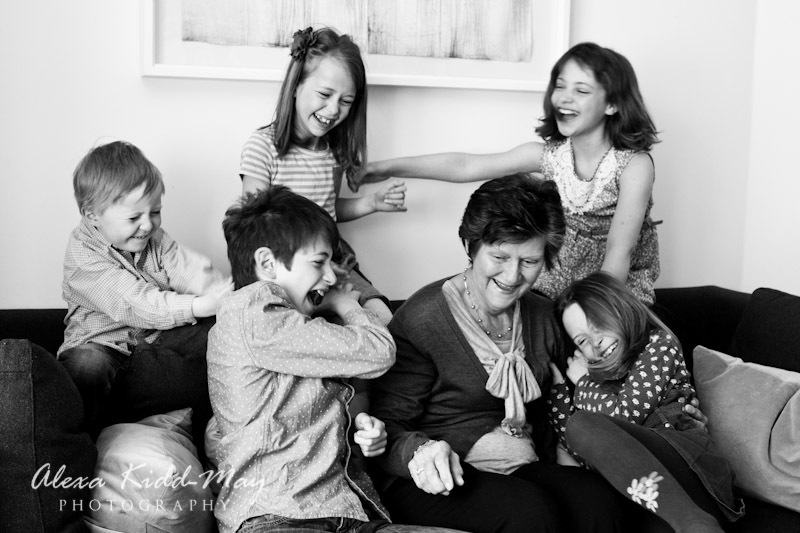 I just love the happiness on the faces of every single child and of the grandma – I hope you enjoy the image too.